Realization#1- I have a raging case of Startitis and have lots of projects started, or bundled up with pattern and needles waiting to cast on. Realization #2- I am a terrible Raveler and I don’t really keep track of projects or take pictures of the things I knit. Realization #3- I should challenge myself to finish two things before the end of the year. Realization #4- It’s hard to photograph when cats are present. The two most likely candidates for finishing by the end of 2015 are WingSpan and Wiggle Wrap. These are the two projects I’ve been knitting the most lately. Both were recently started and they’re holding my attention as I’m knitting both in gradient, color-change yarn. 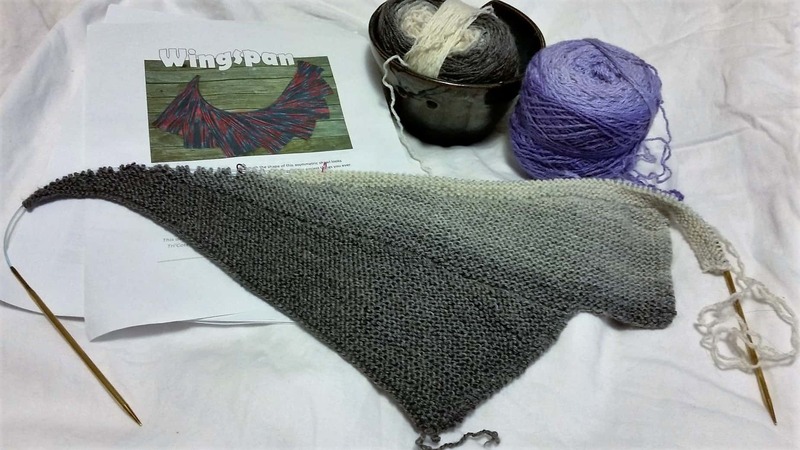 Wingspan is an extremely popular pattern by maylin Tri’Coterie Designs. Right now on Ravelry you can view 10,648 projects ( but not mine as I’ve not yet entered it into my projects page). I’m knitting this Wingspan as a ModeKnit Yarn booth sample, and I’m using two different colorways of our FLOW in ModeSock, Granite and Lilac. I’m going to add the Lilac after I finish the white part of the Granite so the colors flow from dark grey to light grey to white to purple to grey. You can see the white part of the yarn wrapped around the ball in the yarn bowl. Why is it wrapped around the ball like that? Because I had three sections of this done when I ripped it back to start over on larger, sharper needles. I’m a very tight knitter, and I usually need to up 1-2 needles sizes on any project. I think these are size 7 Addi Lace Turbo needles. 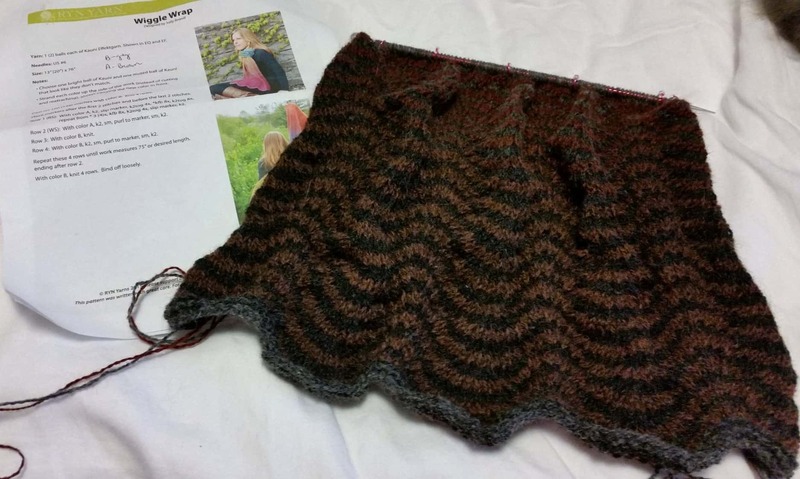 This is excellent “potato-chip” knitting, and a great way to perfect you garter stitch! 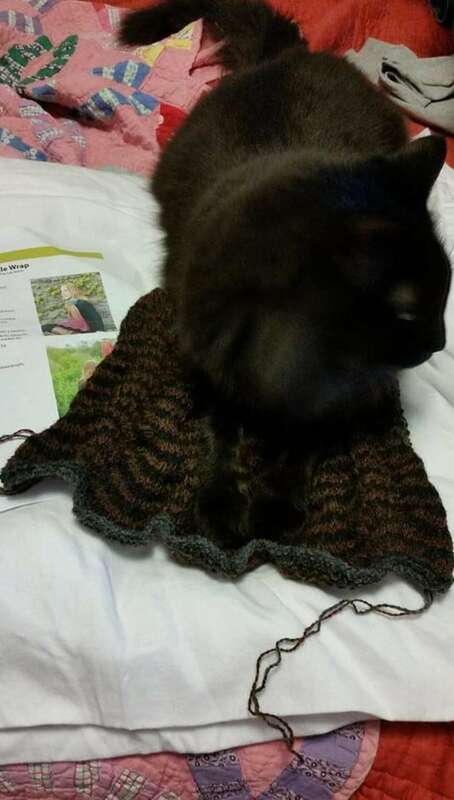 I’m knitting this wrap in the yarn called for, Kauni Effektgarn. It’s a stash buster project; I bought this yarn when a LYS was going out of business and had absolutely no plans for what to do with this. It’s been marinating in my stash for quite a while now. The pattern was suggested to me by some customers in Fosston. They were buying FLOW to knit the wrap in a lighter, less scratchy yarn. I’m knitting this for myself, and I’m going to have to condition it to soften the yarn. It’s nice tv knitting, not too challenging, and it goes very quickly. I like the way the colors are unfolding. This is pretty tonal rather than colorful, but that’s what I wanted. 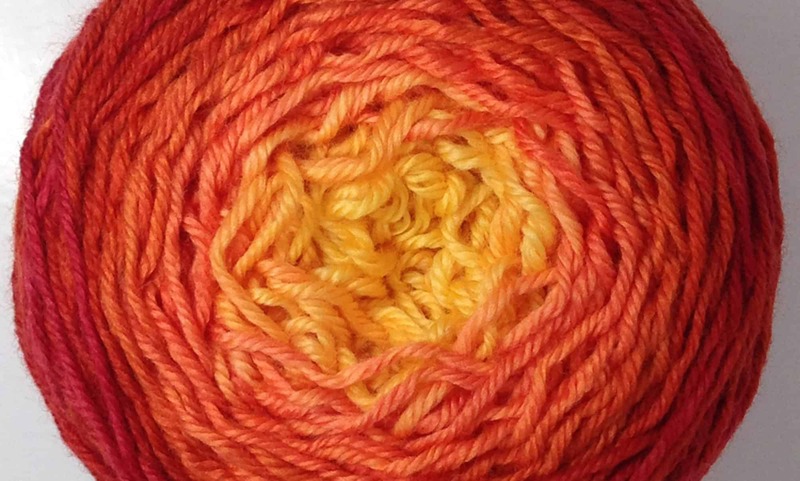 There is a little maroon, pink, white and light grey in the balls of yarn, so there will be a little more color. I’ll share more of my projects as the month goes on! Startitis is better than procrastinitis. I should be 3/4 of the way through with two projects that are still sitting on the sewing table. Need to contract startitis, and then a case of giterdoneza. Flow is such a beautiful scarf. Steph Pearl-McPhee shared one on her blog a while back; it looks so cozy.